According to Do You Know What Planned Parenthood Actually Does?, “the Susan G. Komen Foundation has announced they will stop funding Planned Parenthood for breast cancer exams and other breast-health services.” MoveOn.Org attributes this action on pressure from the Republican Party, because of their stance on abortion and on the abortion practices of Planned Parenthood. As pie charts go, it’s not terrible. 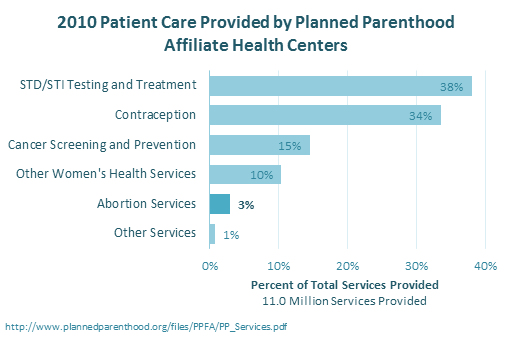 It demonstrates MoveOn’s point, that abortion accounts for only 3% of Planned Parenthood’s treatments. The remainder goes for contraception and health services, mostly for poor women. 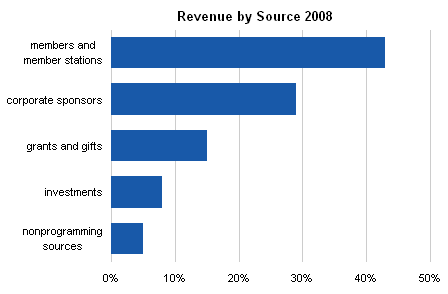 The data is also well-presented using a bar chart. 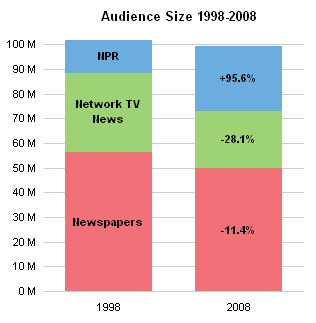 This chart uses larger type and yet requires less space than the pie. The data is sorted in an easier-to-read layout, and it’s easier to highlight one value (abortion) using a darker color, because the chart uses shades of only one color. The bars show all of the components of the whole block of services provided, as indicated by the horizontal axis label. 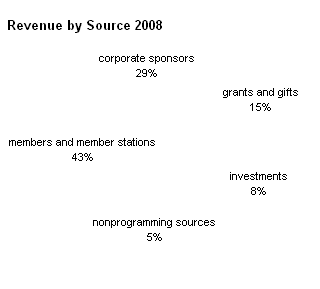 To show that the bars add to 100%, another data series can be added and connected with a line, to make a Pareto chart. 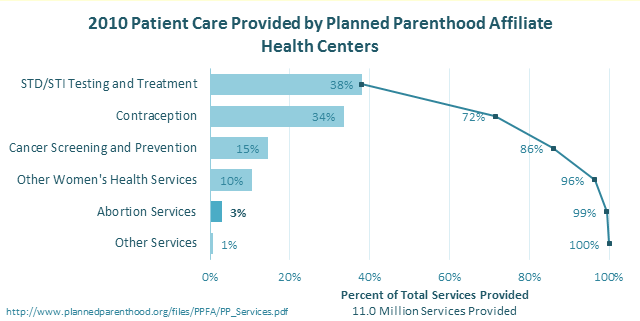 The top four items, all unrelated to abortion, account for 96% of Planned Parenthood services. Posted: Thursday, February 2nd, 2012 under Chart Busters. Tags: bar chart, Pie Chart. So I had to follow the link. 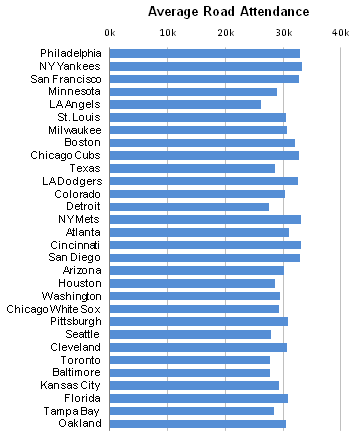 It was an article in Atlantic Cities, 2011 Major League Baseball Regular Season: Attendance by Team, which stated that combined attendance at all Major League Baseball (MBL) games was fifth highest in history. 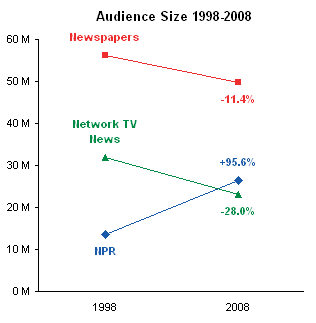 The article was accompanied by a chart, not showing a time series of attendance by year, which you might expect after seeing the “fifth highest in history” statement. Instead, the chart compared the attendance of the MLB teams. And it compared the teams using an unexpected approach. 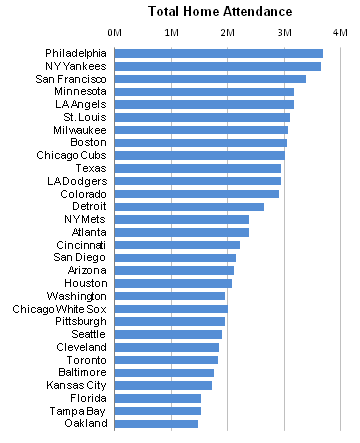 Here’s the MLB attendance chart. 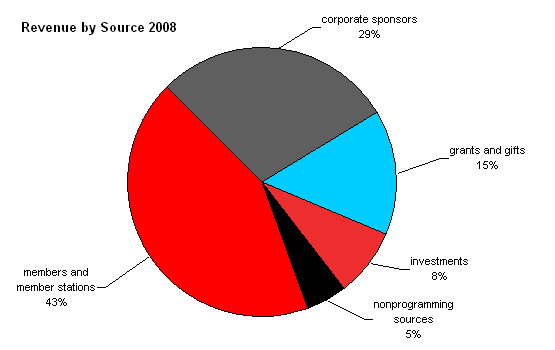 It’s not the worst pie chart ever, but it has substantial deficiencies. The choice of chart type was strange. When you think about a team’s attendance, you think of total numbers. Showing the teams together as a portion of the league total is unusual, and the actual numbers are obscured. Comparison of the sizes of the wedges is not easy, especially with so many data points, but at least the data is sorted. A big problem with this chart is identification of the data points. As the tweet indicated, the randomly assigned colors did not make use of team colors to aid in identification of the slices. There is no legend, but a legend is a poor way to label a chart, because you have to drag your eyes back and forth between chart and legend. In any case there are repeated colors, which would reduce the legend’s effectiveness. This chart addresses the labeling problem by popping up a single label as the mouse passes over each pie slice. Unfortunately you have to wander around the pie to find your favorite team, then wander around again to see how other teams compared, then try to remember what you found before. This cognitive load overpowers the ability to interpret the data. Since the screen capture didn’t capture the cursor, you don’t even know from this image which slice corresponds to the label. It’s the key lime pie slice in the lower right of the pie (it was black in the first view above). Interactivity is a nice way to let a user find additional information that would otherwise clutter a graphic. However, forcing a user to interact with a chart simply to extract necessary information is a waste of the user’s energy and a waste of interactive effects. Granted, showing each category label in a 30-point pie chart takes up lots of room, as you can see in my recreation of this chart below. If you want to show the actual attendance values, well, the labels take over the chart, almost becoming chart junk themselves (see below). The chart has essentially become tabulated data, but not in a nice tabular grid. 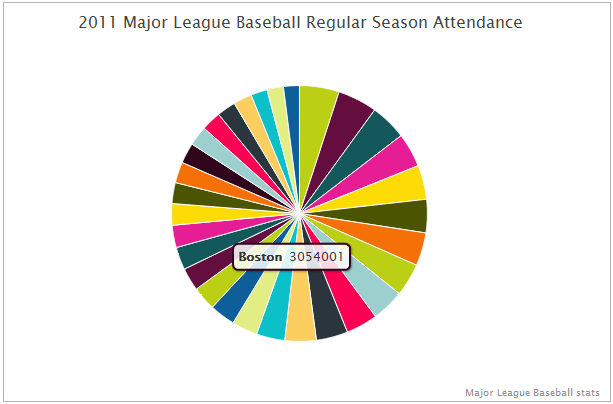 Without showing the attendance values, you have no way to estimate attendance, since the wedges range from 2% to 5% of the total pie circle. Do we expect the reader to multiply an estimated percentage by the posted league total? I just don’t think that a percentage of league total is the best way to display attendance values. How do we label the categories (the teams), and also provide a numerical measure of attendance? A bar chart lines up all the names in a neat list, and encodes attendance by the length of bars along a horizontal scale. Now without mousing around the pie, I can easily see how the teams rank. I can see that Philly had around 3.7 million attendees and Boston had just over 3 million. The data was sorted, but by average home game attendance, not by total attendance. Because of rained out games which were not rescheduled, the relative rankings by the two measures are slightly different. 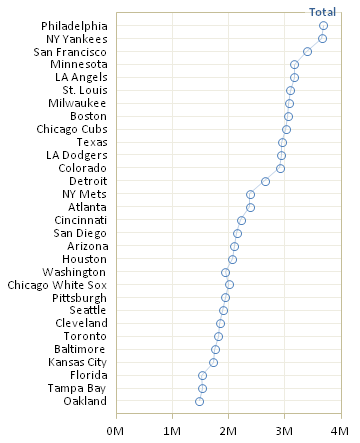 In the total attendance chart above, Washington is listed higher than Chicago but has a shorter length bar, while in the average attendance chart below, the bars are ranked according to length with no exceptions. We can also look at average road attendance. 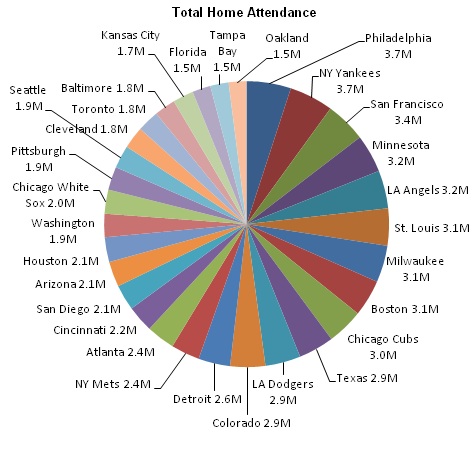 This chart is also sorted by average home attendance. Notice that there is much less variability in the data. 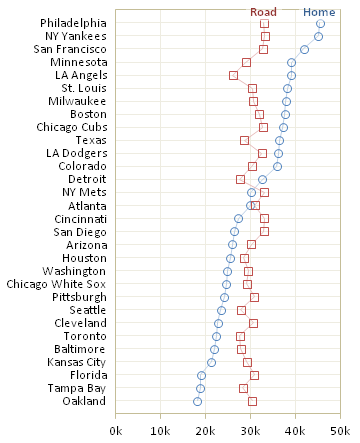 Each team plays in each other team’s parks, and it’s the home team’s demographics (population and fan rabidness) that drive attendance. 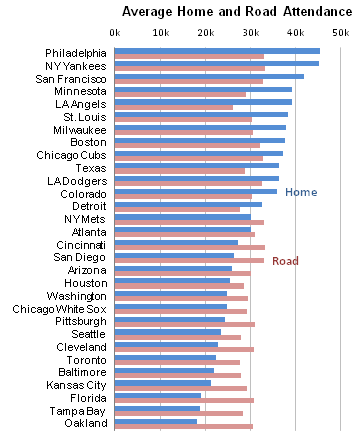 We can plot both series together to compare average home and road per-game attendance by team. I don’t find bar charts very well suited for a dense chart like this: the shorter bars are obscured by the longer bars of the other color. 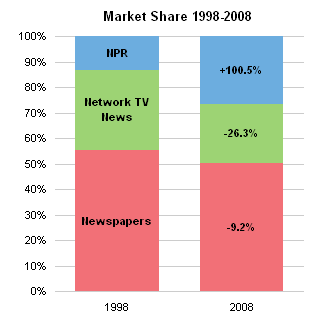 Of course, a pie chart is much less effective at this kind of comparison. One pie chart wouldn’t be enough, you’d need two side by side. This requires a great deal of eye movement and short-term memory to recall the individual values while switching from one pie to the other. When I see two pies side by side, it reminds me of bicycle tires and spokes, and I want to draw in the bike frame. Is there a better way to compare data like this? We can show this data effectively using a dot plot. The values are encoded by horizontal position of a marker rather than by length of a bar. Longer bars do not obscure shorter bars, and even overlapping points can be resolved. Dot plots can be used for any of this data, not just for comparisons. 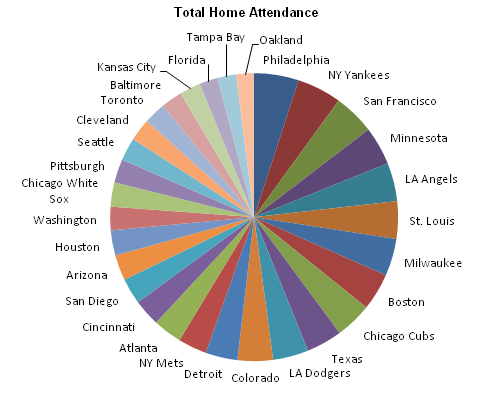 Below is a dot plot showing total home attendance by team. It’s as effective a graph as the bar chart in the previous section. Worst Pie Chart of the Week? 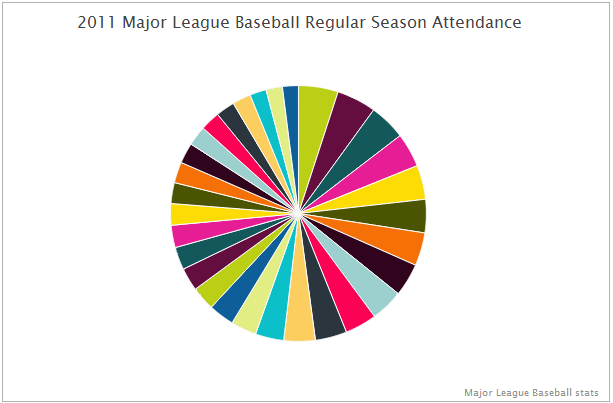 I stated that the MLB attendance pie chart was not the worst pie chart ever. In fact, it wasn’t even the worst of the week. That honor is bestowed on an organization that has the ironic initials “BI”. In CHART OF THE DAY: Goldman Reveals What You’re Getting For Christmas, Business Insider reported results of a Goldman survey about planned Christmas giving. 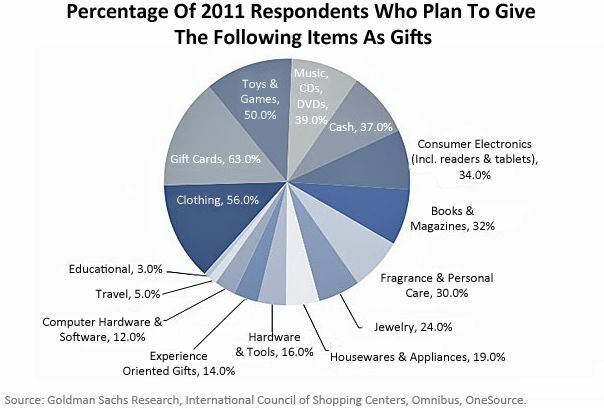 The pie chart shows which percentage of respondents planned on giving which category of gift for Christmas. What’s wrong with this chart? Somebody forgot that pie charts are supposedly good for showing portions of a whole, that is, they show values that add to 100%. Since each respondent could provide multiple answers, not a single answer, the sum of the percentages in the chart above was 434%. Oops. This data should have been presented in a bar chart or dot plot. 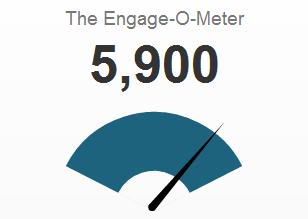 Well, we might have lowered our expectations, had we noticed the Engage-O-Meter gauge in the sidebar of the Business Insider site. Such a gauge is totally useless, since we don’t know what the minimum and maximum values are around the circumference of the gauge. Without the large number above the gauge, we would know nothing. I suspect the needle never moves, and only the number updates. Even if the needle moves, it’s only gratuitous animation, because only the number has meaning. Posted: Tuesday, November 22nd, 2011 under Chart Busters. Tags: bar chart, dot plot, Pie Chart. Ah, we can breathe freely again. 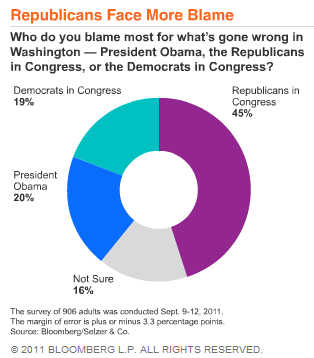 And we can see that people blame Obama slightly more than Congressional Democrats. This 1 percentage point difference was not apparent in the donut chart, and really it may be meaningless given the poll’s 3.3 percentage point margin of error. 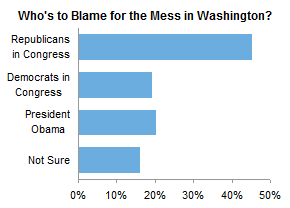 Of course, the Republicans have collected by far more blame than any other category. This is clear in both charts. There is one reason to use a pie for this kind of data, though. Stephen Few himself described The Secret Strength of Pies in Save the Pies for Dessert. Pie charts have an advantage over simple bar charts when you want to compare not single values, but subtotals. 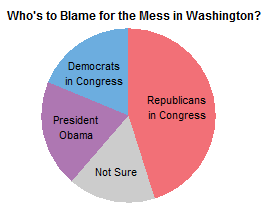 What the donut chart above shows is that the total blame assigned to Democrats, the sum of Congressional Democrats and President Obama, is less than the blame assigned to Congressional Republicans. The pie chart below shows this difference even more clearly: we have not cut out the central region of the pie, which has central angles as well as the areas of the points to help us decode the chart’s values. Sometimes this strength of pies is not realized, because data sorted differently may not have related slices in adjacent positions. However, if you know some categories are related (the two Democrat categories here), you can sort the data to make use of this feature of pie charts. 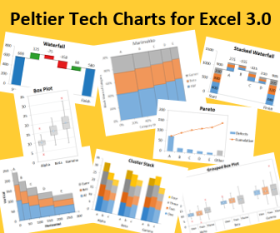 Then again, if you know some categories are related, you can convert the simple bar chart into a stacked bar chart, which sums related quantities linearly instead of circumferentially. 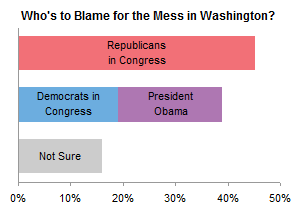 This easier comparison allows us to see that Republican blame exceeds Democrat blame by almost twice the margin of error. Bloomberg’s choice of chart type may not have been as bad as our initial reaction indicates, assuming the data was purposely sorted the way it was. Our stacked bar chart is an even better choice. Posted: Friday, September 16th, 2011 under Chart Types. It’s a week early for Pi Day (next Saturday, 3/14), but Dilbert has provided us with a nice pie chart. It does illustrate the unnatural popularity of the genre, don’t you think? Original at Dilbert comic strip for 03/07/2009 from the official Dilbert comic strips archive. Thanks to Dermot, who emailed this to me moments before I saw it in my feed reader. Posted: Saturday, March 7th, 2009 under Amusement.